Many dairy and heifer rearing operations are looking for increased feed production on a limited acreage for their operation. Planting fall grain rye and harvesting the crop as forage the following spring can increase forage yield per acre and reduce forage production costs. Double cropping fall grain rye following soybean or early corn silage harvest is a viable agronomic practice in most regions in Wisconsin. Research and demonstration data does show however, that earlier planted rye will produce more forage tonnage per acre the following spring. If the fall harvest of soybean or corn silage is delayed and planting is delayed, reduction in spring forage yields can be expected. Spring harvested ryelage can be fed to heifers and dry cows, and early harvested ryelage often contains 15% protein and is suitable for lactating dairy cows. Why produce fall grain rye for forage? Planting winter rye varieties in the fall has several advantages as a forage crop to feed heifers and dry cows. It is a hedged emergency forage crop if alfalfa suffers winter kill. Winter rye varieties will grow later into the fall and earlier in the spring, so it extends the normal growing season and thus captures more sunlight and converts that energy into forage energy for livestock. It provides dairy operations with a forage for dairy heifers and dry cows that will lower the TDN in the ration. Feeding forages with less energy will help keep diary heifers and dry cows from getting too fat. For grazing operations, if winter rye varieties are planted early enough in the fall, lactating cows and heifers can make one or two grazing passes over the field extending the grazing season. The following spring, rye can be the first grass grazed and then plowed under for green manure for a subsequent spring planted crop. Rye allows manure application in the fall before seeding and again just after harvest in May or June. When is fall grain rye planted? Fall grain rye can be planted any time after August 15th and as late as early November (in southern WI) depending on weather conditions. In southern and central Wisconsin fall seeding rye typically follows soybean or corn silage harvest. A typical seeding rate is 90 pounds/acre, however some producers may choose to plant up to 120 pounds/acre to try to increase forage yield. Another option is to reduce the rye seeding rate to 70 pounds/acre and inter-seed alfalfa in the spring with a no-till drill. If no manure is applied, 40-60 pounds of topdressed nitrogen/acre is recommended in the spring. An application of manure in the fall prior to planting will usually supply adequate nitrogen and other nutrients for optimum forage yield. What is the yield of fall planted rye? Generally, fall grain rye will yield 2-3 tons of dry matter with the range of 1-4 tons of dry matter per acre. Optimum harvest timing is in the boot stage. Adequate moisture and hot days cause rye to mature rapidly in the spring, which may shorten the harvest window. An advantage of using fall seeded rye forage for dairy heifers and dry cows is that the range of maturity and the harvest window become longer because lower protein and higher fiber are still acceptable in heifer and dry cow rations. What is the nutrient composition of fall grain rye forage? Delaying harvest of fall grain rye in the following spring will reduce protein and increase the fiber content of the forage. A rule of thumb is if the rye is harvested at boot stage, the forage will have a protein content of over 15%. As a result, a mixture of 50% ryelage and 50% corn silage would be adequate to meet the protein requirement of bred dairy heifers (13 %). If the rye is harvested later, the protein may be as low as 10%. Thus the diet may require additional legume silage or protein supplement to meet the protein requirement of dairy heifers and dry cows. 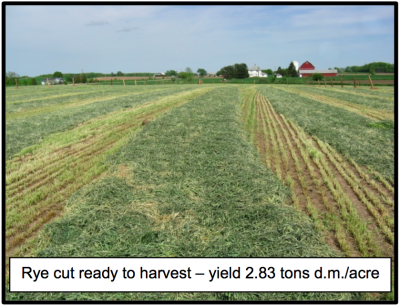 Late harvested rye is advantageous in some feeding situations when forages are required to reduce the energy intake of dairy heifers and dry cows. Finally, rye forages may have a high potassium content which may be a concern in dry cow rations. 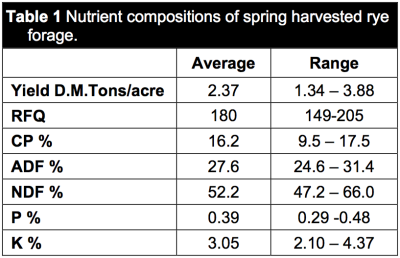 Typical nutrient composition ranges of spring harvested rye forage are presented in Table 1. What are the planting options after winter rye? Most planting options are available to producers, depending on how early winter rye is harvested in spring. Corn, soybean, alfalfa, and alfalfa/forage grass mixtures have all been successfully established. An earlier maturing corn hybrid may need to be planted if rye harvest is delayed into late May or June. No-till is a preferred planting method if the seedbed is in good condition, but tillage may be needed if the field was wet during harvest or manure needs to be incorporated. Some rye will likely regrow from the stubble, but this can be controlled with glyphosate grass herbicides, or mowing. Relative to replant options there are a couple of issues that should be known. First, rye has an extensive root system and the capacity to deplete available soil moisture in years where rainfall is short either before or after rye forage harvest. Keep this in mind as planting options are considered in a dry year. It’s best to harvest earlier rather than later under such conditions. Severe armyworm infestations are a potential problem in corn following winter rye as the cereal forage is an attractive site for moth egg-laying in the spring. Keep a close eye on the developing corn crop and control any rye regrowth as soon as possible. What other issues pertain to fall rye forages? The Natural Resources Conservation Service (NRCS) through the Environmental Quality Incentives Program (EQUIP) program may have cost-share funding to support efforts of dairy producers and heifer growers to use fall grain rye as a cover crop. Fall seeding of rye after soybean or corn silage harvest is an effective management practice to control soil erosion, recycle nitrogen from the previous crop, provide some weed suppression for the following crop, and develop a large root system that will improve soil texture the following year as the root system decomposes. Ergot, a fungal disease, is a concern in rye grain production. Rye forage is harvested in boot or early head stage, before pollination and infection can occur. Therefore, ergot is not a concern in rye forage, but skips and regrowth should be monitored if a forage crop is planted after rye. As dairy operations and heifer growers look for alternative crops to feed their heifers and dry cows, fall grain rye is a unique niche forage. Rye planted in the fall for forage provides a way to extend the growing season, is a flexible forage for various groups of animals, is an excellent cover crop, recycles nitrogen, suppresses weed growth, and is a hedge emergency forage crop in cases of alfalfa winter kill.